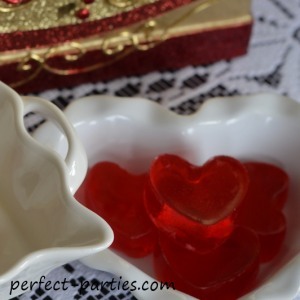 Jello Hearts are cute for Valentine's parties or any heart themed party. I saw this on Pinterest and had to try it! It came out really cute! Be sure to check out some of the the tips I learned while trying this. You can find the original recipe by The Hungry Housewife here. I used my own Jello recipe which is very firm but followed the rest of the orignal recipe. Lightly spray a 9 x 9 pan with non stick cooking spray. Boil 3 cups water and add the sugar and jello package. Turn off heat and stir for about 2 minutes, or until completely dissolved. Remove from heat. Sprinkle the 3 packages of gelatin into 1/2 cup of cold water. Let stand for a minute. Gently whisk the gelatin mixture, and pour into the jello in the pot. Stir well. Pour the jello mixture into the prepared pan and place in the refrigerator for 2 hours or until firm. Boil 1 1/2 cups boiling water and add sweetened condensed milk. Turn off heat and stir until completely dissolved. In a medium bowl, put 1/2 cup of cold water and sprinkle the two packages of gelatin on top. Let sit for 1 minute. Pour the condensed milk mixture into the medium bowl with the gelatin, mix well and allow to cool. Invert jello onto a cutting board and use cookie cutter hearts. Lightly re-spray the same 9 x 9 pan and arrange the cut hearts into the pan. 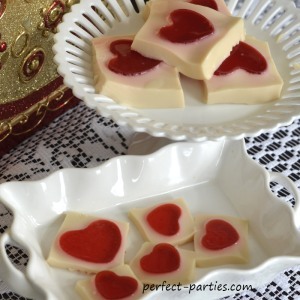 Pour cooled condensed milk mixture into the pan with the jello hearts. Let set for approximately 20 minutes before placing in the fridge. It will take about 2 hours in the refrigertor before it is completely firm. I tried a mold and cookie cutters. I feel the 1/2 inch cookie cutters came out better than the mold. The hearts that came out of the ice tray mold were prettier just by themselves. Be sure to cool the condensed milk enough or you will have red running in it as you pour. But not so cool as it will start to congeal with the gelatin mixed in it. I poured the condensed milk in one corner very slowly and it surrounded the hearts. Do not over fill or your hearts will be covered. After pouring the condensed milk mixture around the jello hearts, let it set for about 20 minutes. I tried to move it to the refrigerator immediately and all the hearts started sliding around! Note that the top that you are looking at will be the top of the jello heart. The underside is not as pretty or the hearts as defined. Using a heart shaped ice tray mold, we made these cute hearts. Just spray with Pam or cooking spray, wipe the excess with a paper towel and pour in the liquid jello, and let cool completely in the refrigerator until it is firm. Tap the back gently to release onto a cutting board or clean surface. If the jello sticks a bit, very carefully turn tray over and hold hearts in place and run warm water over the back of the tray for 10-15 seconds. Be sure to have something below the ice tray to catch any jello released. I think a silicone tray might have been easier to use instead of a hard plastic one.